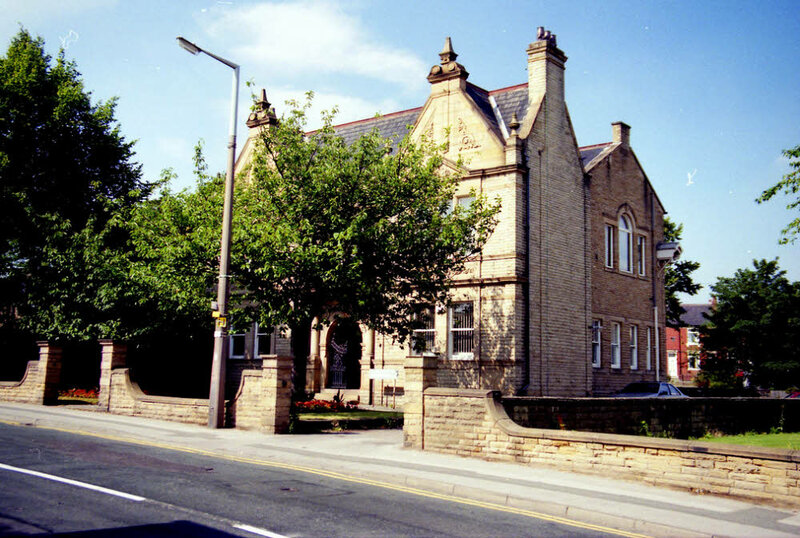 Prior to Horbury Local Board being set up in 1863, the Parish Vestry had managed Horbury's civic affairs. The first chairman of the new Local Board, Mr Fierville, presided over its first meeting in the old Town School, Tithe Barn Street. After some time, the Board moved to buildings in Green’s Yard and, later, offices in an old house on the site of 20 High Street. Elections though would not take place until the inception of the Urban District Council in 1894. The election system involved each ratepayer having one vote – unless you were female. Then you had to be a ratepayer of a property you owned. 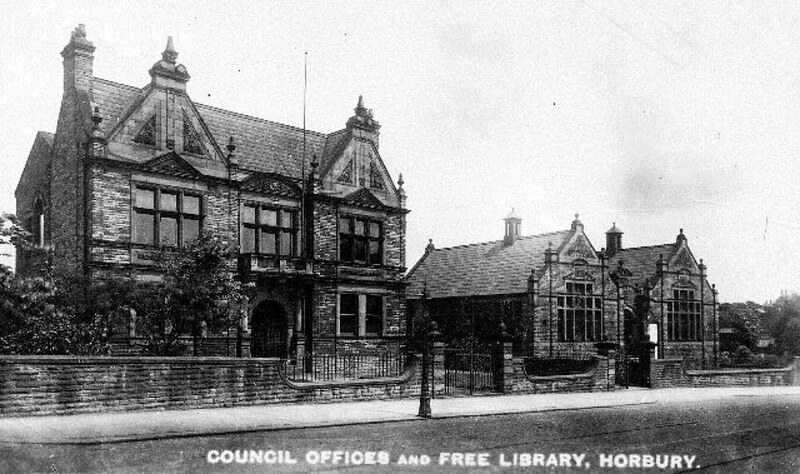 The last meeting of Horbury Local Board took place at the High Street offices on 14th December 1894. The inaugural meeting of the new Horbury Urban District Council (HUDC) was just over two weeks later on 31st December. The plot of land on which the Town Hall and Library stand was previously a house and garden occupied by Mr William Thickett, builder. The land and buildings were purchased by HUDC in 1899 from Messrs Baines for 3s 3d per yard (£2,100 in total) for the land and £200 for the house. Local master builder, Henry Fallas was paid £20 to clear the land. He then undertook the construction work. Above: Horbury Town Hall, Westfield Road. Picture courtesy of Anthony Oldroyd. "A great one, in so much as none of those present are likely to witness such another in the township." 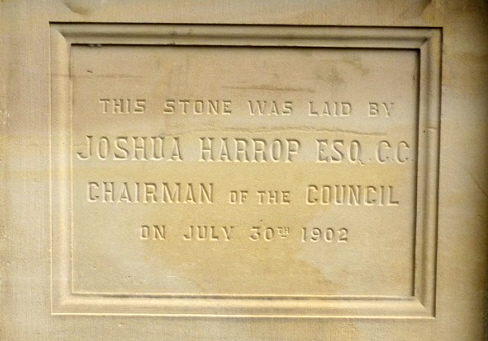 The foundation stone was first laid on 30th July 1902 by local mill owner Joshua Harrop who lived at Cliff House, Horbury. The building contractors were Henry Fallas & Sons and the final cost of the Town Hall was £6,100. 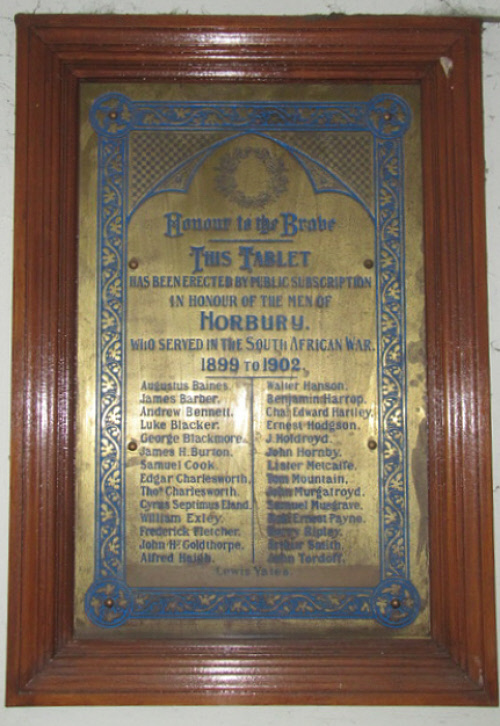 A wooden war memorial plaque honouring those Horbury men who died in WW1 and rescued from the old St Peter's School is still in place in the old Town Hall. "The poles around the low walls served to fly bright hued flags and connect lines of smaller ones which the strong breeze blowing kept in a state of continual animation." An inspiring inscription 'Success to Horbury' formed the centre of the decorations." "On the ground floor, accommodation will be provided for the Surveyor and the Rate Collector and in connection with the work of the latter gentleman there is to be a large public rates pay-office. There is to be plenty of wide corridors so that if more room is needed it can be easily obtained. The Council Chamber, well finished and decorated, of course, will be on the first floor and 37 feet long by 27 feet wide. There would also be accommodation there for the Clerk and the Committee. 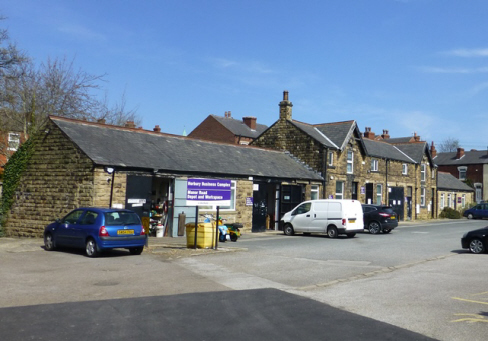 Then at the rear of the site and off the side road known as Manor Road, the stables and sheds for the accommodation of the Council’s horses, carts and street rollers and also workmen’s and plumber’s sheds and the necessary appurtenances are to be erected. This is not all, for the Council beneficently intend to plant trees and small shrubs at the top of the ground, which will form a small recreation ground. The whole scheme including the cost of land, will amount to something over £5,000." "…a place which was really unfit for anyone to sit in. It had been happily termed by councillors around him as the 'black hole of Calcutta' and he should say it was the 'black hole of Horbury.' No-one could stop there for three or four hours transacting the business of the township, without feeling a little bit unwell." 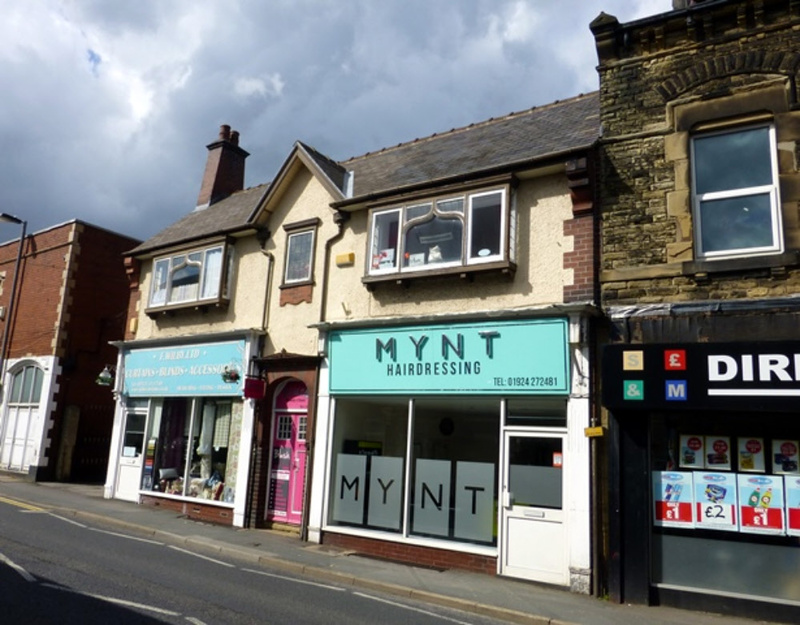 Above: The location of the old council buildings in High Street, Horbury that preceded the Town Hall. Picture by Helen Bickerdike, May 2016. "…the building, both externally and internally, would be a happy medium in regard to ornamentation. Not too ornate nor yet too plain. The materials were to be plain and substantial and, he trusted, the results would be satisfactory to all." Mr. Hanstock presented Cllr. Harrop with a silver-gilt trowel and mallet. 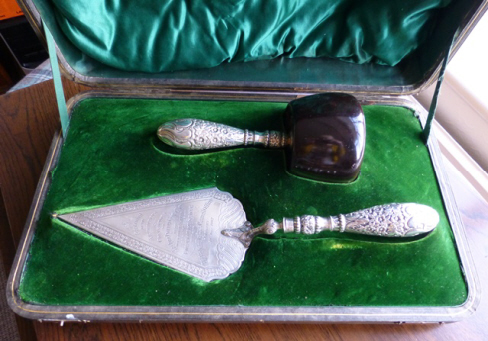 In 1960, the trowel and mallet were returned to the council by Joshua Harrop’s nephew, Arthur. With his permission, Mr Arnold Varley Fallas, grandson of Henry Fallas, Chairman of the Council, was presented with this trowel and mallet on completion of his term of office in 1966. Cllr Harrop said it was, "A grand day in the history of the ancient village of Horbury." At a later Council meeting, Mr W T Raco, on behalf of the Common Land Trustees, presented a stained glass window for the Council Chamber. This was in memory of Sir Gervaise Clifton who had left land to the township 400 years previously. Following the ceremony there was a garden party given by Cllr. Harrop at his home, Cliff House. This was by all accounts a rather lavish affair with refreshments served from a marquee and musical entertainment provided. Cllr. Harrop was presented with a gold medal by his fellow councillors in recognition of his services at the Coronation festivities. At this time, Cllr. Harrop had given 18 years service to the Council, seven of which had been as Chairman. On one side of the medal were effigies of the King and Queen, and on the other the arms of Horbury set on a black band on a white inlaid plaque. The first Council Meeting at the new Town Hall offices took place on the 30th September 1903. The Council adopted the coat of arms of John de Horbury, who was a steward of the Manor of Wakefield for John de Warenne, Lord of the Manor of Wakefield, at the beginning of the 14th century. The council added the Latin motto "Pro bono oppido", which means "For the good of the town." They set three silver towers upright on the black band instead of lying across i in accordance with heraldic practice. 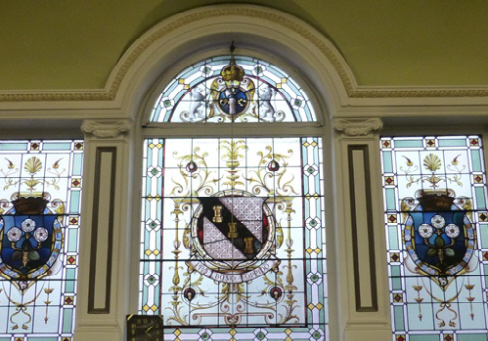 Above: Top Left: Stained glass window inside Horbury Town Hall showing the Coat of Arms on the central window. Top Right: The Town Hall yard behind the main building. Bottom Left: The Foundations Stone laid by Joshua Harrop in 1902. Bottom Right: The silver-gilt trowel and mallet presented to Joshua Harrop after the ceremony. Photographs by Helen Bickerdike, April 2016. "The event and its leading features will long be remembered in the township, for most of the inhabitants, whether their attitude had been one of hearty support of the building scheme, or of criticism of the expenditure, seemed to take a keen interest in the ceremony itself. Not only were the Council Offices decorated with flags and adorned with a suitable motto, but flags were also flying from many private houses." The programme of events was divided into three parts. First there was a private luncheon in the Co-operative Hall, which was followed by the actual ceremony at the Town Hall. Finally, a reception for over 200 guests back at the Co-operative Hall. The luncheon and reception were both hosted by Cllr. Joshua Harrop CC, Chairman of the Council. He finished by telling the assembled crowd that there would be a brass plaque mounted in the entrance commemorating the Horbury men who gave their lives in the recent war. This was the Boer War (1899-1902). Facing this plaque would be another bearing the names of the present Council. “A little bit of vanity,” he said. Next, a special Council meeting was held to receive the new stained glass windows from the Trustees of the Common Lands Trust. Mr. W. T. Race presented the windows on the Trust’s behalf. The assembled company then made their way to the reception at the Co-operative Hall, which had been tastefully decorated for the occasion. Music was provided by Dunnill’s string band, with contributions from, amongst others, Mr. H. E. Cookson, principal baritone at Bradford Parish Church. In 1904, following the success of the Town Hall, Henry Fallas went on to build the Carnegie Free Library next door and was paid £840. The land to the left of the Town Hall was developed into a small park, known locally as Sparrow Park. This is now more formally named Horbury Memorial Park. The Town Hall is a relic of the old Horbury Urban District Council, which was abolished in 1974. The building is now the home of several small businesses. Above: Inside the Town Hall are a number wall-mounted plaques including a memorial tablet to honour the men that served in the South African War 1899-1902 (Left). In 1951, two of the men listed on this Boer War plaque were alive and living in the UK, whilst a third had moved to live in Maracabo, Venezuala. 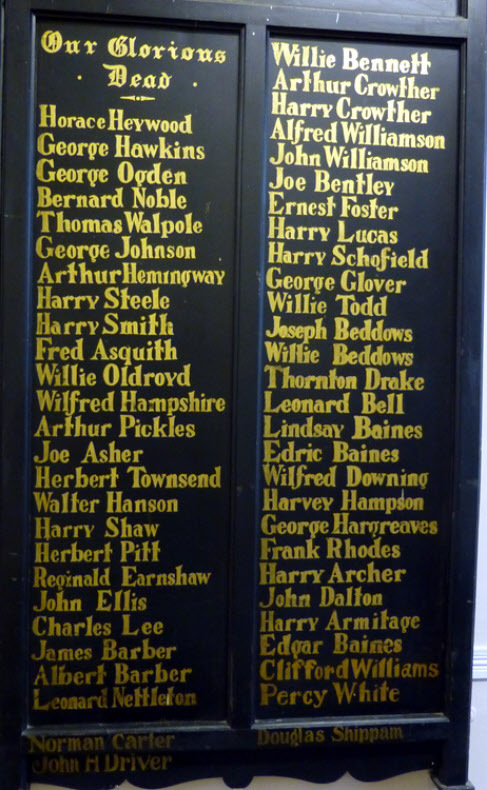 The wooden war memorial plaque (Right) honours those Horbury men who died in WW1 and was rescued from the old St Peter's School when it closed. Pictures courtesy of Helen Bickerdike, April 2016. 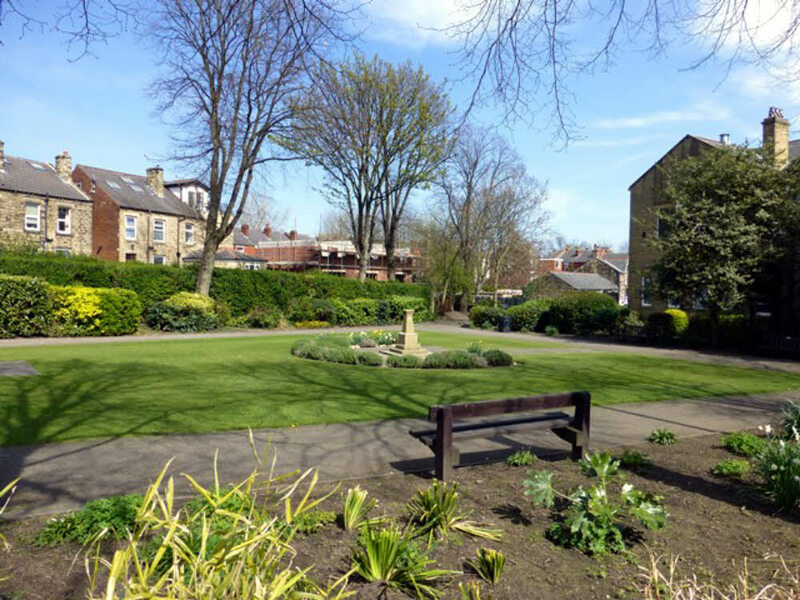 Above: The land next to the Town Hall was developed in 1904 as a garden for public use and was the first area of ground set aside as a public garden in Horbury. It was known locally as Sparrow Park, possibly because of the small size. There were strict rules regarding the use of the park and in 1906, the Horbury Brass Band were allowed to stage an outdoor concert there on condition that "they will see to the children being kept in order and doing no damage." At one time there was a old iron cannon in the park, but in 1941, during WW2, the Ministry of Supply had been given a list of iron railings, posts, chains, etc. in Horbury that could be requisitioned for the war effort. It is thought that the cannon was removed and then melted down for the manufacture of armaments. In 2003, Sparrow Park was subject to a program of renovation and renamed "Horbury Memorial Park." A distinctive curved blue signpost was placed across the gateposts at the entrance to the park with the Horbury coat of arms on the left-hand side and British Legion badge on the right-hand side. A war memorial in honour of the Horbury men who lost their lives during WW2 was erected in the centre of the park and can be seen in the photograph above. 1. "Wakefield Express", 3rd August 1902. 3. "Some Horbury Yesteryears" by R.D. Woodhall, published 1973.